Compare home warranty policies from the top ten home warranty service providers in Rhode-Island. To further assist you in selecting your policy, we have created a graph with a bell curve that showcases the average price of premium and average deductible of the various home warranty policies that are purchased throughout the state of Rhode-Island. View more... The X-axis indicates the price of the premium while the Y-axis indicates the number of homeowners. The start of the curve indicates the number of homeowners who purchase policies that have low premiums. The curve then rises to indicate the number of homeowners who have opted for the average premium and finally dips to denote the number of homeowners who opt for policies with a high premium. The Average Premium of the Rhode-Island is mentioned at the top of the graph. You can also view the Average Deductible that is opted for in the state by clicking on the arrows placed on either side of “Average Premium in Rhode-Island”. We have also calculated the average premium and average deductible price for the major towns in Rhode-Island. Click on the city name to know its average policy premium and average deductible opted for. Review: One year of Home Buyer\'s insurance gave me the confidence to close on a historic home with some historic appliances! When the water heater failed, and later the oil furnace, American Home Shield immediately assigned local contractors who provided great customer service. They worked around my schedule and solved both problems quickly and effectively. I highly recommend AHS! Review: American Home Shield has never let me down. I just made a claim for an oven that was not working. I made the claim online, gave my number and my tenants. Usually I get a call to schedule service from the contractor. After 24hrs, I had not heard from the contractor so I called to see when they could come out to the house. The contractor said, we went out there yesterday and just waiting on a part. I was shocked!!!!! the contractor called the tenant, set up with their schedule, was actually available the same day the claim was filed and didnt have to get me involved at all. It is experiences like this that make it easy to refer my friends, family and neighbors. 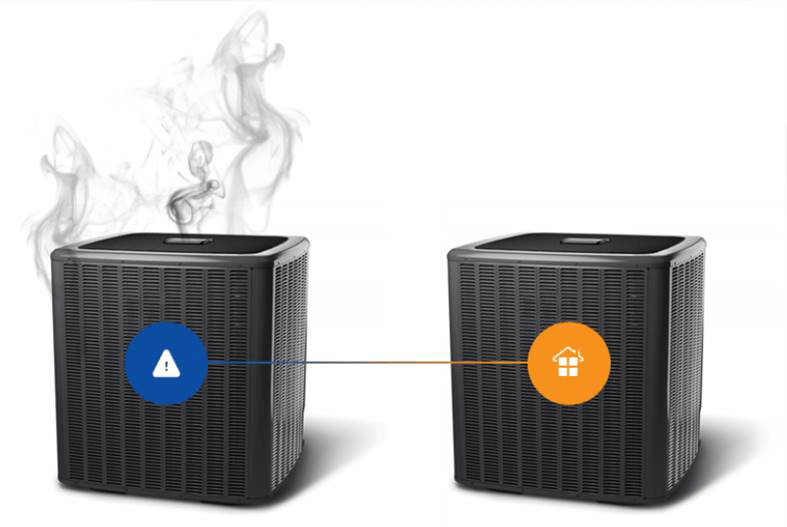 Review: During a very hot period early in the summer, my power started going off and on a few times a day. I had just heard on the local news that power in some areas would be cut off intermittently in order to conserve power. This started on a Monday and continued for the next couple of days. I was very surprised that there seemed to be no rhyme or reason as to which rooms would lose power or for how long. I thought it was being controlled by a computer at the power company, and it was becoming very annoying. I called the power company on Wednesday afternoon and was told that it was too late in the day to deal with it. By Thursday morning, the situation was getting much worse and difficult to tolerate, and the power company checked and told me that there were no more blackouts being done in my area! They said that I needed an electrician. I immediately called AHS. The electricians were very busy but one came out a few hours later, and was I happy to see him! He was pleasant, polite and inspired confidence. He spotted a problem in the electric box and fixed it. An hour later, the power went out again, and the electrician returned right away. A while later, he was surprised to report a major problem in the electric box. He determined that the part he needed was unusual and expensive and didn't have it on hand. It was Friday afternoon, and I envisioned a frustrating weekend without power. However, he managed to round up what he needed and that afternoon completed what appeared to be a difficult and dangerous problem. Obviously, he wasn't a "newby," and I was more than happy that he had made it his business to complete the job before the weekend, and there have been no more problems. Review: It hasn't been real recent, but the most recent dealings we had was when our oven went out, and it was Thanksgiving. The next day we called AHS and they sent someone out the following Monday. They installed a nice GE self-cleaning oven. It was a great experience and I still love the oven. Review: I had a fantastic experience right before the Thanksgiving holiday. My dishwasher rack was broken and I had been living with it for months, but the week of Thanksgiving, it finally came right off the track and was completely broken. All I could think of was all the dishes we would have after Thanksgiving. I made a service request online and had an appointment for the next day. I couldn\'t believe it. The technician was extremely pleasant and fixed it in a jiffy. He knew exactly what to do and it was great! I was very pleased with the entire experience and it was worth the $75. Thanks so much! Review: Once again I had the pleasure of an outstanding experience with AHS.The oven problem I had was looked at, checked into, investigated, and resolved in exceptional time. I had a wonderful experience from customer service to the contractors.No issue was to big. I am very, very happy with AHS. Review: We have used AHS a number of times and each time has been a good experience. The customer service representatives are friendly and the contractors hired have always been great. Review: Only giving this company a 1 star because there is no option no for none. I bought an LG washer & dryer from Lowe\'s a little over a year ago. It recently stopped drying my clothes so I called the service department as I had purchased an extended warranty on both. They had a repair man from G&R appliance come out who said the heating element had gone. When they came out to replace the heating element, a new service repair tech said that the rollers were also damaged due to my overloading of the dryer. I always divide my drying loads so that was an inaccurate. He said he would check to see if he had the rollers in his truck. Then told my husband that he had rollers for a Samsung & they are the same so he used them. Two loads of laundry later, the dryer starts squeaking. Call Lowe\'s repair dept again & they send out repair man from Westport appliance. He informs me that the rollers are too small as they were for a Whirlpool dryer, not a Samsung dryer. He tells me he is going to order the parts but I could continue to use dryer. Went to dry load of clothes & dryer not drying again. Call Lowe\'s service dept again. Westport repair man comes out several days later & could not find anything wrong. May have been a "loose connection" per the repair man. Comes back several days later to change rollers & after he leaves dryer is not drying yet again. Call Lowe\'s again & now repair man from G&R appliance comes out to tell me that the power board & heating element is gone. I called to ask for a new dryer & was told that I do not qualify for a new dryer as it has only been serviced 3 times so does not qualify for lemon law. Total joke. I have a 1 1/2 year old dryer that is useless & have to now go to laundromat dragging heavy, wet clothes several times a week. Totally disgusted!!!!! Review: AHS should change the S in their name to American Home Scam. Never in my wildest dreams of hell itself could I have imagined the the Nigerian Prince from all of our collective e-mail spam boxes be made manifest into an actual company whose sole purpose is to scam peoples hard earned dollars away from them. This is not a company whom is out to help those who pay for their services. This “company” is a telephone line straight to the lowest of humanity who do nothing but waste your time and bill you for your frustration of their fruitless endeavors. I have wasted countless hours on hold only to be connected to a person who will do nothing to help you or any problems you have. This person is only there out of some necessity to prove that this is in-fact a company that exist in the world. Every service call will be met with denial as their entire practice is to frustrate you to the point of hanging up or to get you to begin swearing at them out of desperation so that they can end the call on you. If you would like to speak to a manager, Tough. None exist. If they do, they will be on vacation, in a meeting, or in some other creative way to be unavailable. You will not be able to escalate to these imaginary managers, instead you will be told they will call you back in 24-48 hours. A call that will sadly never come. The process will then repeat itself. The contractors that AHS sends out seem normal, but do not be fooled by their human appearance. They are the demon made flesh. They will review your perfectly reasonable and contractually covered problem only to word their report in such a manner that it will be too confusing to discern or completely irrelevant to the actual problem so it can ultimately be denied by the terms the Dark Prince of the underworld has laid out, meanwhile they will receive half of the spoils from the service fee that will be charged to your account. If you are unsatisfied with how business has been conducted and would like to cancel your contract or receive a refund, you will lose a large chunk of that total because you will be charged a fee for processing and a fee for the fees they’ve had to charge because you were mistaken in thinking they would actually perform the service you spent money on. Ultimately if I have not made my self clear in this review. This company is a disgusting ponsy scheme whose sole purpose is to part you with your money when you are in the most need of assistance. They will do nothing to help your actual problem and will only prolong any actual progress you could make without them. How they are allowed to function is beyond me, as their business practices are as shady as they come. To compare them to the a spam e-mailers is only insulting to the Nigerian Prince. Beware of this company and clutch your purse tightly if you were to ever to pass by them in the night, for they are a plague on all your houses. Review: The customer service representative was very courteous and helpful when scheduling my service. The contractor was very knowledgeable about my plumbing problems. He explain the procedures taken to resolve the issue..
Review: I own a three family and have had american homeshield for over TEN years with very little claims. It seems 2012 was not a good year. I had about three service calls for minor repair and i paid thee 95 service call. I had one heater that needed to be replaced for 2100 which after a big fight, they did. Then they cancelled me effective Jan 1 2013, go figure. For over ten years it was ok to take my money and then when they need to step up, they cancel you. Maybe they are foreseeing future claims, don't know. Forget it if you have an emergency at night and weekends. I actually had a technician say we do not work weekends, after american homeshield said it was an emergency (no heat in winter) Forget them, they do not want to pay claims I have them on my own residence and when my Maytag washer went they wanted to give me 200 towards a new one. they claim they will replace it or fix it, I told them i did not want the 200, fix it. It took a tech two days to fix and the whole machine had to be rebuilt. Their choice. Save your money, these people are difficult to work with and get replacements. I would not recommend them at all. Review: The initial contact with the csr was smooth and easy to follow. Contractor contact was very quick and resulted in the serviceman being onsite within 2 hrs. The service to be performed was explained in detail and done with professionalism. The contractor cleaned up his work area after finishing, presented a receipt for the deductible, and left the job. His manners and politeness were above par. Review: Everyone has been helpful when I call in. They spend time with me to resolve my problem. The contractors are very timely and know what they are doing. I'm very impressed with all the the avenues of American Home Shield.